IN 2010 I COMPLETED A TEXTILE COURSE AT MARDEN COLLEGE. 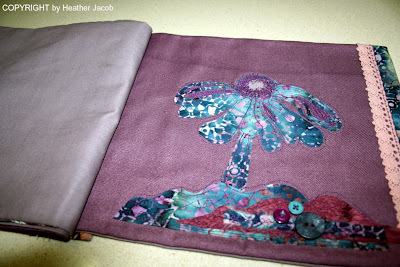 lots of work but heaps of fun.. a great bunch of girls.. eighteen of us ..
one of the projects I thought I would share with you is a fabric book I created . we had to do a project incorporating 6 applique techniques ..
free machine embroidery, stamping, outline stitch and fused technique. Gathering fabrics, stamps, ideas, scissors etc. in preparation. this technique is called NAIVE OR FOLK ART .. we had to create a design using the American folk art of stitching, hand turned and satin stitch, and Broderic Persc .. 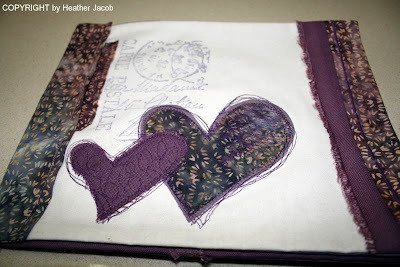 I chose to create another scrapbooking type design with fabric ..
this is a technique using sheers .... 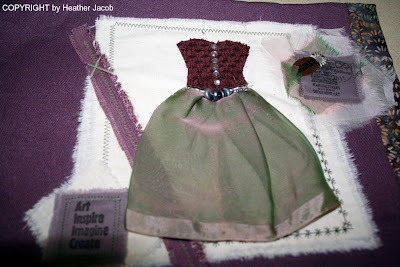 I used a dress-form and created a scrapbooking LO with fabric .. I also used satin stitch, hand stitching and raw edge work ..
this flower design is the reverse applique technique ..one of my FAVES. 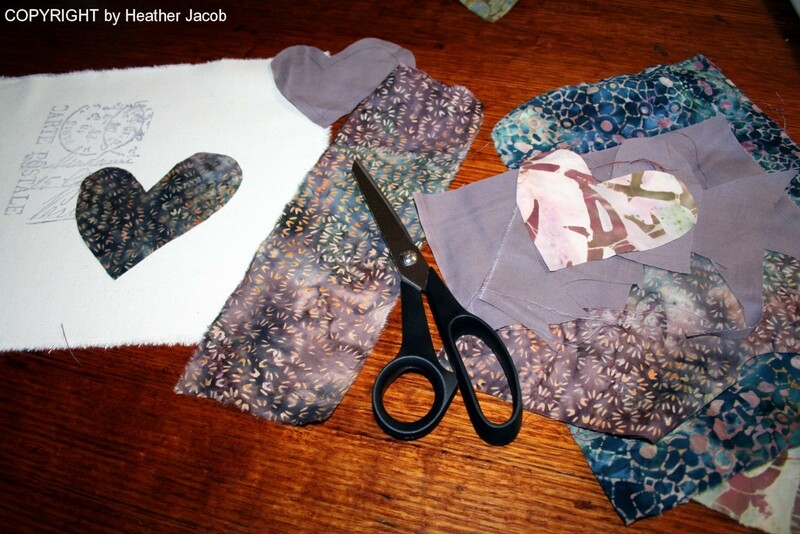 I layered four different fabrics together .. one on top of the other ... then I stitched a design on to the back of the fabric ... then turned the fabric over and proceeded to cut into the fabric revealing the different fabrics underneath, creating a design .. COOL HEY ??? ohlala it is gorgeous ! I love the flower !!!! AMAZING!!!!! You are so clever Heather. 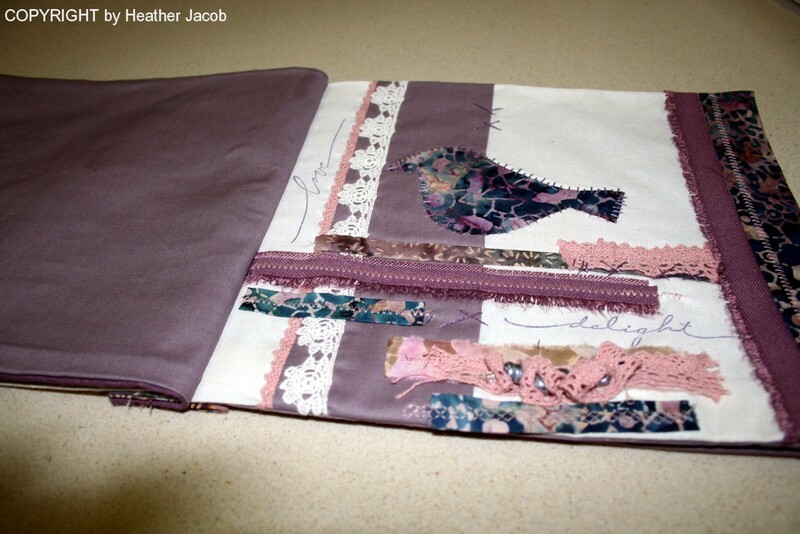 So impressive....makes me wish I could sew!! This is just sensational. What craft can't you do my girl? I just love the colors. 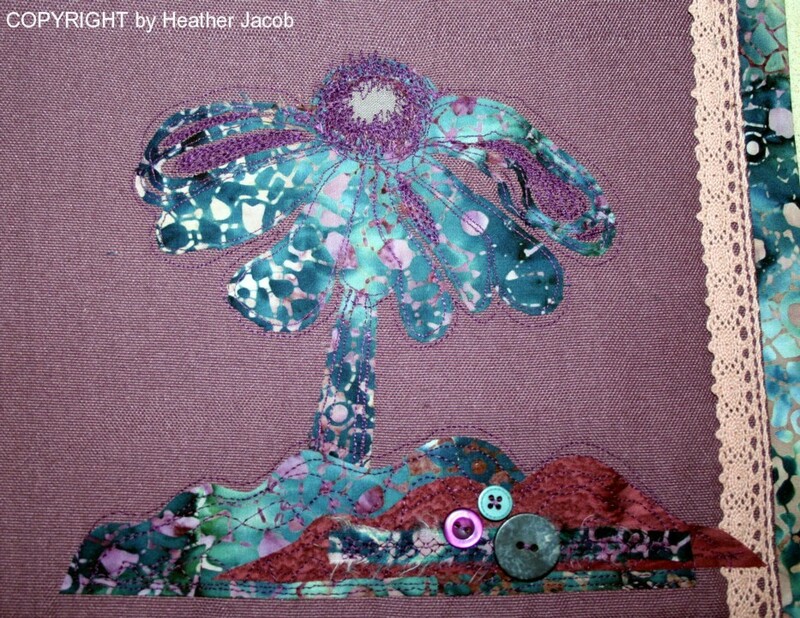 I would love to be able to sew like this. Maybe I need to take a week in Adelaide with you and you can teach me.....lol. 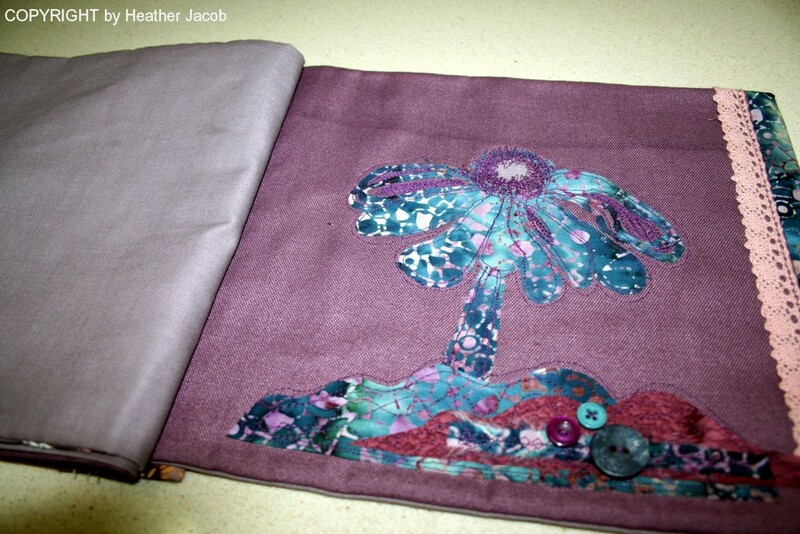 Wow Heather, your fabric book is AMAZING! I love the way you created scrapbooking designs using fabric...that bird and dress are super. Wow! How nice! You have such talent! Heather, beautiful work with needle and tread. And a great idea to create a book on the different techniques. You are one talented lady. Wow that is really cool, Heather!!! So creative!!! omg Heather!! This is gorgeou!! You are such a talented lady! Phenomenal work here, Heather! Wow! The blend of materials and buttons and trims is just gorgeous! woooooooooooooooow!!!!! gongrats girl!!!! amazing work!!!!!! i followed you from helen:)hallloo! !